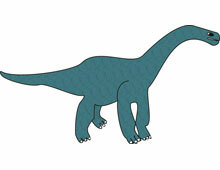 At only 18 metres in length, Camarasaurus was shorter than many sauropods. It was one of the more common Jurassic dinosaurs in North America. Many young specimens, dead before they reached adulthood, have been discovered.